The EVER BOOTS Tank is our pick for the best work boots, which measures 7 inches from arch in terms of its shaft so it is very well-designed. It has a soft toe so it does not compromise comfort, and it also has a full grain construction and is well-insulated. Our step-up pick is the Ariat Men's Groundbreaker and it has a pull on design and has a measurement of 11.5 inches for the shaft up to the arch. It is resistant to oils, slipping and other hindrances in the workplace or area. It has a stitch pattern of 2 rows and it has a better rebound for the insole. The budget pick is the Labo Men's Genuine and it also measures 7 inches from the arch to the shaft. It I made with a rubber outsole and quality leather even for a cheaper price. It has a total of 5 styles to choose from and it has a boot opening of 14 inches. Work boots are an integral part of PPE or personal protective equipment. The jobsite safety footwear can be used in factories, plants, construction sites and other job places and areas where it could be dangerous. PPE is important for those sites because if you are not wearing the proper uniform for your intended job place or area, you may be at the risk of danger for hurting your toes and going absent from the job due to injury. They are usually made out of leather material or anything protective and durable such as those with steel. The main material that is used for jobsite safety footwear is either leather or faux leather. Some have toe boots design to increase prod time, and are made with full-grain leather. Some have safety toe design and have steel construction or welt construction. The durability should be kept in mind the most because the very reason that you are getting a pair of jobsite safety footwear is to keep your feet as protected as possible when it comes down to a jobsite or job area, to make sure you do not get injured later. Steel ones are important for safety and durability, such as those with leather upper and a good insole. They are also called steel toes. Safety can always be compromise in your job area if you are not wearing the right gear. Possible dangers that can happen in your job or work area that involve your feet include falling debris, stubbing your toes or getting hit by a heavy object, which has the capability to crush your toes and feet, rendering you incapable of job much later on. To prevent these horrific scenarios, you should wear safety footwear with steel for the remainder of your work time. Fashion comes less important in terms of prod boots with steel, but functionality is greatly important. The color choice of the jobsite safety footwear is not that important, but it can also be important if you prod in the dark. There are many other kinds of pairs of boots, such as toe work boots, timberland pro, steel-toe boot, and the men's boots that are for plantar fasciitis. There are certain jobsite safety footwear that do have reflective areas to let people know that someone is there, along with your protective vest or hard hat that may also be reflective at night or in dark areas, where other jobsite members might not see you as a person due to poor visibility. Some, like the red wing, have a good outsole, with steel toes, and can also be a lace up boot. Comfort levels are also greatly important in terms of jobsite safety footwear. The jobsite safety footwear should be comfortable for the person because if you wear a jobsite safety footwear that is not comfortable then you will get tired too easily at work, you may get work fatigue and you may also end up with injury because of the lack of focus. Therefore, you have to make sure that you also get comfort with your jobsite safety footwear. It is not just men – but also women – who can wear working boots. Many models and brands of jobsite safety footwear nowadays are offering both male and female counterparts for the working boots or work boots. Therefore, it is important that you take your pick wisely, as the jobsite safety footwear for men can have a different style than those for women. Either way, it goes to show that both men and women can be at risk in their respective job fields, and they need all of the protection they can get from properly fitting jobsite safety footwear. 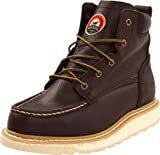 Among famous brands of work boots include Wolverine, Caterpillar, Irish setter, Golden Fox and many more. For men or for women: you should consider if the wearer of the jobsite safety footwear is a male or a female. This is so that you can assess what kind of style the jobsite safety footwear should be. In most cases, there will not be too much differences between the shoes for men and for women, other than the style of the curves and the fashionable designs to choose from, plus the color variations. Sizes available: the jobsite safety footwear should have a wide amount and selection of sizes for you to choose from. This is so that if you ever have to return a size, there will be a more comfortable and more suitable option for you. Go for brands that are more famous and have more sizes available in order to get the best kind of comfort from wearing your specific jobsite safety footwear. Style: the jobsite safety footwear can be mid cut or high cut depending on the requirements of your work nature. The style is usually of individual taste, and may depend on your preferences or the preferences of your company or employer. For really harsh terrain and better protection, some people may want to choose jobsite safety footwear with a higher cut so that their ankles and leg parts are also greatly protected. Other than that, it is up to you. Color choices: you may also get different product color choices for the jobsite safety footwear, although brown is the most apparent color for you because of the leather type safety footwear being common around. 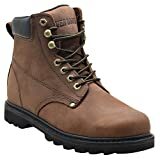 There are, however, other shades of brown, such as brown black, light brown and many others that are available, so that no two pairs of shoes can be mistaken for each other in a jobsite or work place area. Lace or no lace: you also have to consider if the jobsite safety footwear that you want will be something that has lace or no lace. For most factories and job sites, a jobsite safety footwear that has lace can be troublesome because you have to keep tying it if it goes out untied, unless it is really secure. Having a lace or no lace jobsite safety footwear really depends on the wearer’s preferences. Durability: jobsite safety footwear should be generally durable to withstand crushing impacts of the jobsite, such as with debris, metal, steel and other components that may ruin your foot health. You have to make sure that the jobsite safety footwear are really meant for the job site and not just for fashion shows. You have to make sure that if it is made of leather then it should be quality in order to get value for your money and safety. Comfort factor: the jobsite safety footwear will be worn for hours upon hours of labor, so it should be comfortable at the very least. Having a comfortable jobsite safety footwear entitles you to working longer and getting tired less because you are wearing a pair of comfortable work shoes. This is important when it comes down to the overall productivity of your work nature, so make sure that your jobsite safety footwear are indeed okay to wear for longer periods. As our top pick, the EVER BOOTS Tank can be easily resoled for those who do not feel comfortable with the insoles, making it a comfortable and customizable work boot. It has been made in the toughest construction to meet the criteria of most work places and areas around the world, while being made with premium leather felt for its construction. There are also speed hooks to make fastening the whole footwear easy, as well as a back loop. It also has a welt construction that adds to the durability. It has a full grain construction as well, and a soft toe design that makes it comfortable for wearing for longer periods of time. The measurement from the arch to the shaft is 7 inches. Most people believe that they'd be good for outdoor activities. Also, loose areas can easily be fixed with a gel insert or heel cup. The product is backed by a 3 month manufacturer’s warranty. The only con but not a deal breaker with the EVER BOOTS Tank is that the insoles may be a little off for some people. However, it can be worked around by getting a better pair of insoles. The Ariat Men's Groundbreaker is our step-up pick, which is great for those who work under the open sky, such as those in construction work, farm work and the like. It can be used by equestrian athletes as well, other than being work boots. A resisting duratread outsole can withstand oil and liquid slipping to make you feel safe and comfortable all the time when wearing it. There are 3 color choices available: brown, black and timber. It is made with a rubber outsole and has a shaft measurement up to the arch of 11.5 inches. It has a round measurement of 15 inches on the opening of the boots. It has a 2-row stitch pattern for added durability to the wearer. The breathable mesh lining keeps the person as comfortable as possible while having a good bit of traction in many varying terrains. It can be a good replacement if your Caterpillar boots worn out. The Labo Men's Genuine is our budget pick, which is a combination of leather and rubber for the outsole part. It is made with 5 design choices while having an arch to shaft measurement of 7 inches. It has good durability and comfort without compromising your budget. The measurement for the boot opening is about 14 inches while the heel has a measurement of 1.75 inches. It is also made with oil and slip resistant feathers for extra work safety. Because of the insulation and comfort combination, you can stay warm during cold winter with these work boots. It is also water resistant to make sure that you stay comfortable and dry within the jobsite or work area. They can be holding up well to walking and can offer good support and feel sturdy. The can mostly be used for metalworking jobs because they are generally tough with excellent construction while being comfortable and stylish. Made with a steel toe design, the Caterpillar Second Shift can be used by those in the construction site and have a threat for their toes and feet. Steel toes can help protect your feet against really heavy equipment like steel and metal, when they land on your feet. There is also speed lacing at shaft in grommets to make sure that you don’t get the hassle of maintain your shoes when in a jobsite, with good breathability and comfort. What’s more, the traction outsole is made with oil resistant material. It is made with rugged leather that also combines the materials from a plush collar to make sure that you get comfortable. It also has a tongue part with logos to identify the manufacturer of the work footwear. It is also an ANSI Class 75 steel toe so that you can use it according to ANSI standards for really high class jobs. It can withstand up to 600 volts in dry conditions as well, while the lace hardware though the laces provide durability. The Skechers Men's Verdict is a great choice if you need to work on somewhere with a lot of rain and liquid, since they are waterproof shoes. Smooth fabric shoe lining is what makes this pair very comfortable to be worn for longer periods of time. In addition to that, the padded collar makes you feel very lightweight despite having a work boot and a warm, comfy shoe that can offer more cushion and support than other shoes. In addition to that, the construction and the tongue shock absorbing midsole also makes it ideal for those times when you need to be in action in your nature of work. Also, the rugged rubber lug traction outsole keeps you in sync with your work and help you to stay on your ground. There are also metal eyelets to make sure that the whole boot piece goes perfectly with lasting durability. It is also conforming to your feet because of the natural curve to the sole of the boot. It has a safety toe and is a pair of men’s boots with a good width. It has a good welt construction, a good sole, and is a pair with a nice outsole and a leather upper. The Ryno Gear Tactical has a beige color so it is great for those who don’t want the generic brown color for the shoes. The whole construction is a combination of leather and ballistic nylon material to make sure that you feel at ease with your current work and you can face many kinds of danger ahead. Also, the durability is well-done due to the construction of the padded collar, which also further adds comfort. The contrast stitching detail also makes it stand out from the competition. Adding to the comfort factor is the breathable mesh lining. To make it truly a safe pair of shoes for working, it is also made with slip-resistant rubber outsole. It is also made with water resistant inner lining for those times when you need to do your job in the rain. It also has some removable shock absorbent insoles to keep you comfortable as long as possible. The KEEN Utility Men's is a good choice for most construction sites since it is both durable and comfortable due to the non-metallic construction, which most people will like. It also has a rubber outsole that is sturdy and just right for its size. In addition to that, the included shaft has a measurement of approximately 6 inches from arch, so it is good for those with smaller feet, ideal for all day work. Additionally, it has left and right asymmetrical composite toes so that you can maximize the traction and the comfort levels whenever you are on the jobsite. It is also made with a waterproof breathable membrane so that it can be used in the mud and in the rainy days during your construction or outdoor field work. It is also made with Cleansport NXT technology to act as an odor control mechanism in the most natural way possible. For those working in an industrial field, the Maelstrom Industrial Boots is a good choice for you. It is very lightweight and has good safety features. It also has many styles and colors to choose from, and it has flexible durability that can keep your very own feet dry in the harshest environments, due to the weather resistance and liners. Its outsole is made with a non marking slip and oil resistant material to ensure safety all the time. It also adheres to the ASTM F1677-96 Mark II standards to make it qualify as PPE for most work factories. The shoes is also made in ISO9001-certified factories so that you are guaranteed of quality materials and construction. It also has a composite toe – good for outdoor activities, and it can give you a good speed and a professional look in terms of working in any area, whether indoors or outdoors. It is currently backed by a 1-year manufacturer’s warranty. With a soft toe design for good comfort, the KINGSHOW 1406 Premium has good traction due to the directional lugs on the rubber outsole part. It measures 3/4 inch on the platform while it measures 1.5 inches on the heel part. It has an arch measurement of 5 inches so it is fairly good in terms of height. It is also slip resistant to keep you safe on the area, and it has an upper part with good water resistance. It can provide you with traction on varied terrain due to the outsole, while being relatively lightweight in terms of overall construction and flexibility. They are also good for just wearing around casually and you can add some orthotics to fit nicely because you can still have room for a thick sock. Other than for jobsites, you can also use them in outdoor activities like fishing or camping on rain or snow days. The Irish Setter 83605 is a good choice for those who want more traction due to the EVA traction tread. It is also durable with a full grain waterproof leather for you to easily withstand the elements. It also has a removable polyurethane foot bed so that you can truly customize it with your custom orthotics and the like to keep your feet comfortable during your job. It also meets ASTM F2413-11 Safety Standards as PPE or personal protective equipment. It has an arch measurement of 5.5 inches with a 13.5 inch measurement for the boot opening, coupled with durably modern materials for tough onsite durability. With the combination of the durable metal eyelets, you truly get gear that can be dependable in construction work, or even for any light manufacturing environment or even on warmer temperatures. 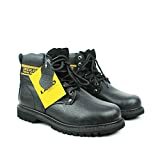 Other jobsite safety footwear did not make it to our list because there was a limited stock for the sizes available and they were also reported to be uncomfortable for most wearers. Durability and safety must come as well as comfort in terms of picking the right jobsite safety footwear or shoes. Q: Why are job site or construction site pair of safety shoes important? Debris can hit your feet and cause you to feel uncomfortable and get injury. Cuts can happen to your feet if there are sharp objects in your area. Electric shocks can happen in the job site or construction site to your feet so you need to keep your feet insulated. Tripping and falling are the most common problems of being in the job site. A: What are the different kinds of tough shoes for your feet? They are worn in the job site to protect against slipping and threat or hazards and can increase prod of the worker. Some types include toe boots, men’s boots and toe work boots. Some can even be made with full-grain leather or cowhide material for your feet to stay protected. They are worn mostly in tough terrain conditions and in the countryside, and have a good welt construction for your feet to be protected. Some can be a lace-up boot with a good outsole and a leather or cowhide material upper. They can be used in the wilderness and in the great outdoors and in rough terrain for your feet. They may also have a leather or cowhide material upper. They can be more fashionable than other types of tough shoes for your feet, usually with a leather or cowhide material upper and better outsoles as well. Q: What materials are used for job site or construction site pair of safety shoes? This is the best kind of leather or cowhide material possible, and can be made with oils, which makes it into wax leather or cowhide material or wax hide. This one is from calves or young cows. They are generally much more expensive and are also known as fine grain leather or cowhide material. They are from goats and they are great for resilience and strength, and they do not have too much weight on them. Nubuck is a kind of material that is similar to leather or cowhide material but with a buffed surface on the outer part. This is a kind of leather or cowhide material that may be obtained from a specific kind of animal, such as from snakes, ostrich, lizards, alligator and other birds and reptiles. It comes from pigs and is also known as brushed leather or cowhide material or suede leather or cowhide material. It can also come from hogs and has good durability or sturdiness which can make good material for shoe linings. This one has a glossy feel and a urethane resin. It is mostly done in the factory, otherwise known as synthetic leather or cowhide material. Suede leather or cowhide material is known as buffed leather or cowhide material on the underside, and can come from a wide range of leather or cowhide material types, including goat, pig or cow leather or cowhide material. 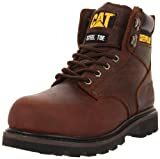 Other than leather or cowhide material, there are also cheaper materials that can be added to job site or construction site pair of safety shoes on their upper parts. They are less costly but might not be that durable. Q: What is the importance of PPE? 1. Protect your hands and feet. 2. Keep your eyes and ears from danger. 3. Stay away from respiratory diseases. 4. Keep yourself visible in dark areas. 5. Reduce instances of slipping. 6. Take care of your skin while on the job. Q: What are the classifications of PPE? Q: What are the differences between composite toe and steel toe job site or construction site pair of safety shoes? Q: What are the different properties that job site or construction site pair of safety shoes should have if you want to protect yourself from electrical threat or hazards? This means that your tough shoes do not conduct electricity at all, and are indicated with the EH rating. This means that they will not conduct electricity from any live wire or live source. Categorized as ESD or SD job site or construction site pair of safety shoes, these ones can protect the equipment you are handling from static electricity, which can come from your body. It is important if you job in a factory or plant that makes circuit boards or chips. They are a supportive form of tough shoes that can be worn if you get exposed to harmful electrical threat or hazard in the area or job site or construction site. They do not, however, protect you from live wire threat or hazards. Q: What are the different parts of the tough shoe? This is the part that lies inside of your tough shoes and can be replaced depending on your preferences. This part of the tough shoe is found inside and gives the wearer stability all throughout the time it is worn. It is made with plastic like materials that can lie between the leather or cowhide material and the heel part. This one has abrasive properties and is finished properly to make sure that you do not slip easily in the tough shoes. This one is the part of the toe that keeps the tough shoes its proper form and shape. This one is the stitching that keeps the form and style of the tough shoes, and can also add to the support for the wearer. It lies in the shaft on the top line, and can help the wearer fit the tough shoes better. This one is what makes the tough shoes neater, and is made from natural materials like pigskin, twilled cotton, glove leather or cowhide materials and the like. There are also other synthetic materials that can wick away sweat and odor. It is the part of the tough shoes that can control shock and reduce impact to the wearer. It is the part of the sole of the tough shoes that can keep the wearer stable. Unlike the insole, it cannot be replaced. It goes between the leather or cowhide material and is usually synthetic in construction, which also adds to the appearance of the tough shoes. This part of the tough shoes can be what you can use to easily get your feet into each tough shoe. The top part of the tough shoes in which you put your feet first before you get inside the tough shoes. This is the arch supporter of the foot when you wear your tough shoes. It can be made with various materials. It keeps the sole part and the welting part together to add to durability or sturdiness. It is a decorative part that can help you close your tough shoes and secure them in place. This part is the quarter or is the upper part of the tough shoes that does not include the bottom part. This is decorative stitching that is placed on the tough shoe, if any. The welting is attached to the sole and the upper and is usually made of synthetic material or leather or cowhide material. It is the part that binds together the welting and the insole, and gives the tough shoes durability or sturdiness and a better appearance. Q: What are some dos and don’ts in terms of job site or construction site pair of safety shoes or toe work boots and breaking them in? 1. Test your tough shoes first if they fit properly. 2. Walk them around anywhere, especially at home. 3. Use leather or cowhide material conditioner to keep it healthy. 4. Test them at job or in prod if you think they are properly fitting. 5. Make sure you get a warranty for your tough shoes. 1. Don’t ignore hotspots and slight uncomfortable areas. 2. Don’t put them in water – it can damage the leather or cowhide material. 3. Don’t put them in extreme heat, either. 4. Don’t kick them off after removing them – it will damage the heel. Q: What are some important tough shoe etiquette? 1. Follow the establishment’s rules and regulations about tough shoes. 2. If there’s a place to store tough shoes, put them there before entering. 3. Always clean your tough shoes through a mat or rug before entering any area. Q: How beneficial are leather or cowhide material shoes? They are made with durable material that can last for years. They are natural so they are more breathable. Most of them are very fashionable in style. They are easy to fit as compared to synthetics. Because it is made with natural materials, it reduces the likelihood of waste materials from synthetic resources. They can be easy to clean if treated properly. Q: How do you take care of your job site or construction site pair of safety shoes? 1. Use a leather or cowhide material conditioner during the break in period. 2. Apply a waterproofing agent to keep them dry. 3. Use a water based cleaning agent in cleaning them. 4. Add wax for leather or cowhide material tough shoes, if necessary. Q: What are the dangers and threat or hazards that construction laborer or employees usually face? 1. Motion injuries – these can happen if you work in an area with a lot of moving objects, in which you will need toe boots in order to withstand pressure and motion injuries. Safety toe footwear can help you to reduce the likelihood of motion injuries. 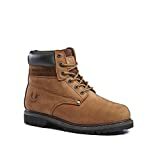 If they have sturdy steel material with a leather upper, you can withstand the damage of such problems at the jobsite. Sometimes, women's work boots and tactical boots can also help with it. 2. Collapsing of the scaffolding – if your prod area requires a lot of scaffolding work then it can be hard for you to manage the balance. This is why you need to consider if your feet are well protected and if you wear safety toe shoes in the jobsite. Scaffolding can be dangerous due to the steel parts hitting your feet. Having a good welt construction can help a lot with your problems of scaffolding injury risks. 3. Falling from high distances – steel construction is a risk for injury if you have to work on high distances. You need to keep your feet protected with a well constructed leather upper and a durable design. 4. Collapsing of the trench – when you consider a good pair of protective jobsite safety shoes for your feet, you should consider one that will help you to balance better while you are in the trench. 5. Unable to use the PPE in the nick of time – you must always wear your protective jobsite safety shoes for your feet so that you can stay protected against hazards and injuries in the long run. 6. Electric shock – many people die each year due to electric shock. You should definitely wear better protective jobsite safety shoes for your feet so that it will not cause you danger later on in the jobsite. 7. Arc flash (for welding) – arc flash can happen if you work in a place that involves welding. To combat this, use protective jobsite gear for your face that can help you survive with less injuries. Q: What are the dangers and threat or hazards that power plant laborer or employees usually face? Q: What are the dangers that nuclear power plant laborer or employees usually face? Q: What are the dangers that skyscraper laborer or employees usually face? Q: What are the ASTM footwear standards for job site or construction site pair of safety shoes? Q: Which state in America have the most number of fatalities in the construction site? A: According to an infographic with 2012 data, Texas had the most number of construction site related fatalities, totaling to 105. Maine had the least, with less than 5 fatalities. Texas was also reported to be in the top 5 states that had the most number of laborer or employees in the construction industry in all of the United States. Q: How much will companies lose if they don’t give proper safety gear to their laborer or employees? A: Companies may lose up to $170 billion yearly if they do not treat their laborer or employees well and give them PPE and safety measures. This is why PPE is not just important to keep the laborer or employees safe, but it is also important for the company not to lose income in the long run. Without the laborer or employees and the laborer or employees, your company will not have productivity. As a whole, we think the EVER BOOTS Tank is our pick for the best work boots due to the straightforward shaft design, good insulation, full grain construction and comfort on the toe. Comfort is extremely crucial when looking towards safety and stability in any workplace, such as in a construction site or any jobsite possible.